Nathasha Munaweera grabbed the day’s first victory for Sri Lanka when she defeated her Malaysian counterpart Hannah Seen Ean Yip in comfortable straight sets 6/3, 6/2 in the ongoing ITF Junior Circuit Week II girls’ singles main draw first round match at the Sri Lanka Tennis Association (SLTA) clay courts yesterday. Nathasha was very confidant from the beginning and left no room for her opponent to pose a threat. 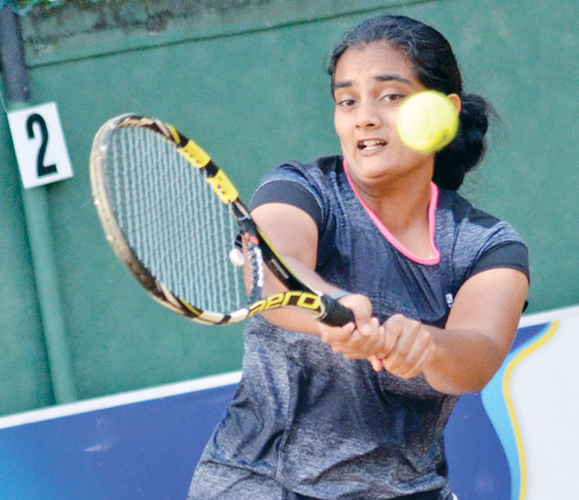 Lankan ace Anjalika Kurera partnered with India’s Snigdha S. Baruah won a hard fought battle over their Indian opponents Jannat Kaur Anand and Chandhni Murali 7/6(4), 6/4 in yesterday’s girls’ doubles main draw first round match. Anjalika and Snigdha advanced to the girls’ doubles quarter finals. The other Lankan boys’ singles Wild Card entrant Chathurya Nilaweere lost his first round match against India’s Rudra Kapoor 2/6, 2/6 as the Indian sailed through to the second round comfortably. Lankan pair Dhilvan Herath and Shivendra Perera went down to third seed Malaysia’s duo Jian Keong Takeshi Koey and India’s Boopathy Sakthivel 3/6, 2/6. Kavisha Ratnayaka partnered by Luca Emanuel from Germany dished out a superb doubles game beating their Pakistan rivals Muhammad Nauman and Ahmad Asjad 6/4, 6/3 in the boys’ doubles first round. SLTA host the prominent junior event with the aim to give more opportunities for Sri Lankan players to compete in international level in order to gain much needed international exposure. Junior players from more than 10 countries including USA and Germany are taking part in the tournament.